The only thing funnier than Sheldon on a normal day is Sheldon on a sick day. He truly lives up to the term “man-child” this episode as he’s got the flu with a side of sass for everyone. He’s doing all better at the beginning of the episode, but is shocked to see that no one is happy that this little ray of sunshine is beaming again. Apparently, he was rude to everyone all week, and they’re giving him the silent treatment. Throughout his sick days, each of them reached out to try and make him feel better. Penny cooked him breakfast, made his bed and even checked his mouth for thrush. Bernadette and Howard brought him a care package with the strongest medicines. Emily offered her medical expertise to check on him while Leonard served him some homemade soup. Stuart even dropped in to bring him his favorite comics. Unfortunately, there was no new rendition of “Soft Kitty” in any of these care packages. In return, Sheldon responds with insults galore, including this jab at poor Stuart, “Oh, great, Death is literally at my door.” Ouch. 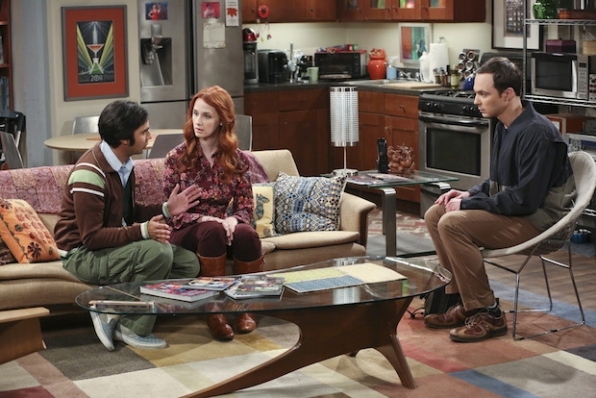 Since everyone is shunning Sheldon, he turns to Amy, who is conveniently still at her neurobiology conference. Turns out she stayed a few days after it was over, and it wasn’t because of Detroit’s sleeting streets. Sheldon still doesn’t get why everyone is so upset with him, I mean, he had a 101 fever, he’s allowed to be cranky. Meanwhile, the boys are planning a trip to Vegas sans Sheldon. Look at how well a break did for Amy and Sheldon’s relationship. Leonard suggests a party bus to take them to Sin City and Penny is all for it as long as the bus has booze and music rather than juice boxes and video games like Howard had at his birthday party. As they’re making plans, Sheldon overhears them and quickly decides he doesn’t want to go to “America’s urinal cake.” Atlantic City without the taffy? No, thank you. However, Leonard immediately tells him that he wasn’t even invited to begin with. Ouch again. It takes another Skype session with Amy to make him realize just how hurtful he was to his friends. He’s upset that they’ve excluded him from the trip, but she gives him a lesson on empathy by having him say aloud everything he did to his friends and convincing him to apologize. This strikes a chord with him, and he decides to give it a try and with an added twist of an M. Night Shyamalan movie, he’s going to mean it. The first annual Sheldon Cooper Apology Tour is about to commence. First up is Leonard, who he gives a sincere apology to and Leonard accepts, but reminds him that it’s not up to him to allow him to go on the trip. Sheldon hurt the whole gang, so he’ll have to make his rounds. Challenge accepted! Finally, his last stop is Raj and Emily. Raj happily accepts, but Emily is standing up for herself because she’s tired of him always insulting her. This leads to Raj and Emily having their own fight, and Emily storming off. 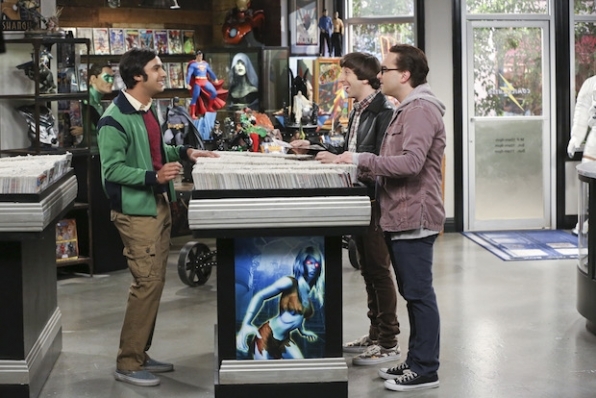 Back at the apartment, Sheldon is filling everyone else in on the fight when Raj storms in and goes off on Sheldon. Apparently, he tried to apologize to Emily again at her place, but instead of making things better, he just left her crying. It seems like the only noble thing Sheldon can do at this point is stay at home and let them have the weekend to themselves. He might not be going to Sin City but he sure did take a trip to Sincere City, where instead of genital warts, the only growth he’ll come back with is personal growth. I swear, all these t-shirts need to be part of The Big Bang Theory’s merchandise. So the day to leave for Vegas has finally arrived, and as the gang is admiring the party bus, Sheldon drops a Bazinga on them. He was hiding in the bus’s bathroom the whole time…with Stuart. He wants one more chance to apologize to Emily and he does so flawlessly, so he’s allowed to join them…and Stuart too. This was a much better episode than last week. We’re getting a lot of material with Sheldon, and each week, he grows more and more. Who would’ve thought that Sheldon Cooper would ever apologize and actually mean it? The Sheldon Cooper from season 1 definitely didn’t. So here’s hoping for more personal growth from our favorite man-child. And less of Emily.